The police will take departmental action against inspector Vavinder Kumar, who had been the investigating officer in a case of alleged embezzlement of wheat, meant for ration depots in Gurdaspur. The scam came to light in November last year when the anti-narcotic cell of Amritsar rural police, headed by Vavinder Kumar, seized as many as 50 bags of wheat meant for government ration depots in Gurdaspur and arrested two persons, including a ration depot holder, in this connection. 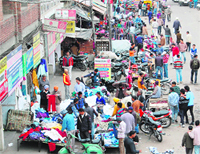 A market of illegal small businesses, ranging from clothes to mobile phone accessories and cosmetics, runs from the footpaths of the link road outside the Amritsar railway station. With an aim to boost Indo-Pak trade ties, a 55-member delegation of traders from Pakistan crossed over to India via Attari-Wagah land route to take part in a trade expo, which is to take place in Ludhiana on February 23-26. City-based voluntary organisations continue to violate Municipal Corporation norms of keeping the city clean. They hold langars or free community kitchen at roadsides to commemorate special occasion. However, they fail to take charges of disposing the trash. Nine-member delegation of Canadian Parliament today held an interactive session with the members of Confederation of Indian Industries (CII) to chalk out business opportunities in the region. Board examinations are knocking at the door and students in the city are sweating it out hard to welcome it with a smile. This time of the year is the toughest for an average Indian teenager as the examination fever heats up. Physical education experts have expressed concern over rise in doping cases and stressed on adoption of scientific outlook in a two-day national seminar on “Futuristic Trends in Physical Education and Sports” that kicked off at Khalsa College for Women (KCW) today. It is believed that a society's advancement is visibly recognised in its art and culture. Amritsar, being a culturally rich city, has always respected its own. Although the art and culture of the city suffered a setback during the period of terrorism, it has now revived and is even attracting the international artistes. The Amritsar rural police has booked a convicted prisoner, who went on a parole 10 years ago and did not return. The CIA staff today arrested a member of a vehicle-lifters and looters’ gang, which was busted in January last year. Vimal Kapoor and his son Parth Kapoor, who were held by the police on Sunday for allegedly betting on cricket matches and Assembly elections, were sent to judicial remand today. The police will take departmental action against inspector Vavinder Kumar, who had been the investigating officer in a case of alleged embezzlement of wheat, meant for ration depots in Gurdaspur. The scam came to light in November last year when the anti-narcotic cell of Amritsar rural police, headed by Vavinder Kumar, seized as many as 50 bags of wheat meant for government ration depots in Gurdaspur and arrested two persons, including a ration depot holder, in this connection. But, Vavinder Kumar was removed from the case following allegations of slow pace of probe. Harjit Singh Brar, SP (D), Amritsar rural police district, was then appointed the investigating officer in the case. He was also asked to probe into the role of Vavinder Kumar in the case. With the transfer of Harjit Singh Brar from Amritsar, the Amritsar rural police has recommended that the investigations be conducted by a DSP-rank official and the CIA staff, said Ram Singh, DIG border range. “I have given my approval to this recommendation,” he added. The Amritsar rural police has also recommended departmental action against Vavinder Kumar, said the DIG. It is pertinent to mention here that the senior police authorities had received a number of complaints regarding the slow and tardy pace of investigation. There were allegations of discrepancies in recording statements against Vavinder Kumar too. It may be recalled that Pardeep Singh, a resident of Ajmalpur and a ration depot holder, was held by the anti-narcotics cell when he was going to supply bags of wheat procured from ration depot holders at Gurdaspur to flour mills located at Fatehgarh Churian road here. He was intercepted near Bal Kallan village at a naka. Later, during the investigations, one Gaurav of Devi Nagar at Fatehgarh Churian road was nabbed and another haul of wheat bags were recovered. A case under Sections 420, 406 and 411 of the IPC was registered at Kamboh police station in this connection. Several more names of ration depot holders had cropped up during the investigations. The Food and Civil Supply Department had suspended the licenses of four ration depot holders besides issuing notices to several other finding discrepancies in their record. The department had also issued notices to several officials of the department in this connection. The Amritsar rural police recommends departmental action against inspector Vavinder Kumar, who was probing into the case. Better known as Landa bazaar or Chor bazaar, it has become a major bottleneck for commuters, especially those in a hurry. The footpath doesn't even seem to exist when the bazaar is in operation. Cots stacked up with clothes and other items occupy the whole footpath thus causing problems for pedestrians. Moreover, the stalls even occupy part of the road, which put commuters to trouble. The rush on the road is such that drivers often avoid this route even. Traffic jams are the routine here. However, shopkeepers are not deterred as they believe that the rush is good for their businesses. Prempal Singh, a school teacher, said, "This road seems so much wide during the early morning hours. But since the bazaar opens, the road is hardly commutable. Earlier, the shops just occupied the footpaths. Now these have come on to the road. If the administration cannot set things right, then the road should be closed for traffic." Besides the link road, Chor bazaar shopkeepers have encroached upon the GT Road opposite the railway station. Jagandeep Singh, another commuter, said, "Illegal eateries here have benches and chairs for their customers. This reveals that nobody has ever questioned them about blocking the footpath and the road." The drivers complained that the shopkeepers are reluctant to pull back their charpoys or rhehris even an inch. "Even during jams, they turn deaf to horns and requests," said Rippenjeet Singh Khosa, a driver. He said the traffic police must take notice of the things to make things easier for the general public. He stressed on the need to increase trade transactions between the two countries, as it will lead to stronger Indo-Pak ties. He also advocated relaxation in visa norms to increase people to people contact. Farah Asif, a fashion designer, said she had visited India earlier too, but this time she is excited towards exhibiting her designs in Ludhiana. She felt that holding such trade expos on both the sides of the border will go a long way in improving the relations between the two countries. Similarly, Nafisa, another member of the delegation, said she basically hails from Mumbai, but is married in Karachi. She said this is her third visit to India for a trade exhibition. She said initiatives like these will help the two countries reduce the trust deficit existing between the two neighbours. Yesterday also langar stalls were installed at various places of the city to mark the Mahashivratri. The streets today presented a repulsive look as leftovers, leaf plates, thermocol glasses and plates were spread all over. Manbir Singh, a tourist from Chandigarh, said it is generous of the organisers who hold langars (free community kitchen) and chhabeels (distribution of free sweet water) to commemorate religious occasions. It is a noble tradition; however, the organisers need to take extra care to keep the area clean and free from litter. Sudarshan Kumar, a resident of Nagina Avenue on Majtiha road, said leftovers, plastic plates were stuck in the drains of his area. He said separate garbage containers must be placed close to the langar stalls and cleaners should be employed to clean the area. 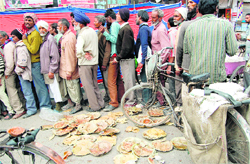 Langar stalls were installed on roads hampered the traffic movements. MC Commissioner Dharam Pal Gupta said no punitive action has been taken against these organisations. He said instead of taking harsh action, the MC aims to educate the voluntary organisations to keep the city clean while holding langars. As per the MC rules it is mandatory to take MC’s permission before organising langar or chhabeel. The rules also state that stalls should be installed at least 10 to 15 feet from pucca road and it is the responsibility of the organisers to ensure that leftovers and garbage are thrown into the dustbins and not on roads. They are also to ensure that the area is properly cleaned after the conclusion of langar and chhabeel. Other than these, the organisers are not suppose to hamper traffic flow and are expected to serve clean water and healthy food. Indian businessmen and Canadian parliamentarians deliberated on way forward for promotion of trade between the two countries. They shared their views on developing Indo-Canada ties. CII’s district unit chairman Suneet Kochhar stressed that tourism and hospitality were two main sectors which need to be tapped as Canada has citizens of Punjabi origin. He said Canada and Punjab shared a bond since late 19th century when veterans of the British army, mostly Sikhs, decided to move to Canada. Today the bond was even stronger, which was made possible due to favourable and tolerant environment that Canada offers. Since the economic liberalisation, many Canadian multinational companies, such as Sun Life, Hatch and SNC-Lavalin, have entered the Indian market. The Canadian companies want to tap the growing market of India general and Punjab in particular. The trade between the two countries is also picking up. Indian exports to Canada have seen a 16.47 percent increase in 2010-2011 as compared to the previous year. Although a drop of 7.14 percent is seen in Indian imports for the same period, the total value of imports is much more than the total value of exports. Member of Parliaments Merv Tweed, Larry James Miller, Christine Charlton and Peter Arnold Stoffer elaborated on the rules and facilities being offered by their government for trading fraternity. Besides, Senators Nancy Ruth, Dr Elizabeth Mary Riddell-Dixon and Terrance Michael Mercer also interacted with the businessmen present over there. Consulate General of Canada Scot Slessor, Andrea Pottyondy and Elizabeth Kingston were also present. Each year we talk of stress busters and each year the stress count just increases a wee bit more. As city students prepare to face their worst nightmare, we check out what they have up their sleeves to have a good night sleep during board examinations. “One gets distracted easily during exams. Working out on a plan throughout the year and sticking to it is the key to maintain calm as the examination day approaches,” says Pooja Bhandari, a Class XII student from Guru Harkishan Public School. The main agenda should be to stay focused. And how? “Prioritise well and leave everything else for later, because right now, study should be occupying your total attention. Personally, I have kept myself organised throughout the year by sticking to a self-study routine so that I don’t panic at the eleventh hour,” she says. Study schedules are quite strict during these days and it can cause a lot of mental fatigue. While some prefer to stick to their textbooks, there are others who choose to relax a bit. “I study at least six hours after school and it’s a lot of pressure. To keep myself some time out, I go out for walks in the evenings and do some physical activity. Also, I sometimes listen to music between the study hours,” shares Sahil Rattan, another student sitting for boards from city. Entertaining yourself to cope with the stress doesn’t exactly mean going for a party, but just taking small intervals during the study hours to loosen up. “Boards are a crucial time and I have always suffered from anxiety before exams. But this time I have tried to restrain it by planning ahead. I keep my cool by eating well, taking good sleep and just ignoring the stress,” says Sanjog, a student from Spring Dales. With tough competition written on the signboard ahead of the exams, there are talks of stress busting pills, memory enhancing supplements and additional “support” systems that students resort to. But Amritsar keeps its distance. “These are totally uncalled for. Board exams are not some on-the spot thing, you have the entire year to prepare for it. Then why use such unhealthy practices that can have long term ill-effects,” says Sanjog. Academicians, scholars and sports personalities advocated research in physical education to achieve new benchmarks. They stressed on more research and scientific outlook in physical education and asked sportsmen and educational institutions to work together to end the evil of doping in sports. Former Chairman Dr NS Maan of Department of Physical Education, Panjab University, Chandigarh, said many evils had intruded in the field of sports but physical education as a subject basically profess to live a meaningful, healthy life and also inculcate team spirit and behavioural goodness among us. Khalsa College Governing Council Honorary Secretary Rajinder Mohan Singh Chhina, who was the chief guest at the seminar, stressed on the need of sports in educational institutes. He said physical education enable us to live a disease free and healthy life. He also welcomed the guest speakers and participants in the seminar. Dr Karen Guldberg, senior lecturer and therapist of University of Birmingham, UK, while addressing a seminar on autism organised at Khalsa College of Education, said the teachers have a great role to play in empowering the autistic children. The seminar was organised by a UK-based NGO in collaboration of Sarav Sikhaya Abhiyan, Amritsar, in which teachers from Tarn Taran, Kapurthala, Hoshiarpur and Amritsar participated. Dr Karen said autism was a major challenge throughout the world and that people must adopt ways to deal with the special children. Another physiotherapist from UK, Dr Shabdam, also said throughout the world there is a growing concern about autism among the children and how to teach them. College principal Dr JS Dhillon said there was a rising consciousness and commitment to serve the special children and the aim of the seminar was to apprise the budding teachers about the new techniques and research taking place in this field. Among others, Dr Karnail Singh, pediatrics at Government College, Amritsar; Jaspal Singh, District Education Officer Elementary; Sukhpal Singh, District Project Coordinator, Sarav Sikhaya Abhiyan; Dharminder Singh, District Coordinator, IED; Vinod, Assistant Coodinator, Parho Punjab and representatives from Inclusive Education Resource Teachers (IERT) programme were also present. About 175 students of Guru Nanak Dev University College, Chungh, were felicitated for their achievements in the field of education and cultural activities during its first prize distribution function at the college premises. Dr MS Hundal, college dean, presided over the function and distributed the prizes. The college principal Dr Mohanjit Nagpal Sethi welcomed the participants. Assistant Professor Dr Gurinderjit Kaur presented vote of thanks and college registrar Dr Gurcharanjit Singh detailed about the activities of the college. Addressing the students, Dr Hundal said he hopes that the students of this college would bring laurels to the region and the nation. “Lahore and Amritsar were famed for their active art and culture; they were the hub of creativity. In the 60's we had flourishing open air theatres where stalwarts like Sardar Gursharan Singh and others were involved. But in the time of terrorism, everything related to art died an untimely death,” said Brar, who witnessed the rise, fall and rebirth of performing arts in the holy city. The city has crossed the troubled waters and its reviving pace has been tremendous. With the opening of Virsa Vihars, Punjab Natshala and many others the future of the artistes of visual, performing and fine arts looks promising and secure. “Theatre, folk art and entertainment have improved in Amritsar. The city can now boast of having its own cultural centres to facilitate new talents and technology,” said Jatinder Brar, owner of Punjab Natshala. “Theatrical arts have seen a rise like never before. Women participation has increased. Even the countryside theatre or folk arts are developing,” said Kewal Dhaliwal, noted theatre personality and director Virsa Vihar. With fresh talent, original ideas, new concepts and technological advancements, the Punjabi regional arts are appealing global markets. The recently held first International Theatre Festival, where more than seven countries participated, is a proof of that. “Pakistani artistes often come and perform here. But today we have artistes from Poland, Italy, Mozambique and the US to share a common platform with the Punjabi artistes,” said Kewal Dhaliwal. The so-called dying folk art or rural art is reviving now, sources said. “There are villages along the border where rural theatre is still active. A village near Attari border, Preet Nagar, has its own theatre. Every month a play is staged there by local artistes. These artistes also perform at international folk festivals,” he adds. Youth festivals too have popularised the Punjabi folk art at national and international level. “These forms of art have become more professional, glamourised and commercialised. That is why the artistes can imagine of a better future,” said Brar adding that local artistes like Kapil Sharma, Chandan Prabhakar, Sudesh Lahiri and Gurpreet Ghuggi have made it big. The prisoner, identified as Darshan Singh, a resident of Jalal Usma village, has gone on four-week parole in February 2002. On Sunday, Mehta police (under whose jurisdiction the village falls) booked Darshan Singh under Section 8 (2) 9 of the GC PPR Act following the orders of district police chief SPS Parmar. 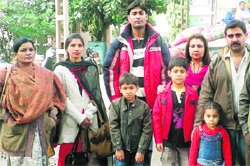 He was serving life imprisonment at high-security Amritsar central jail in a murder and dacoity case. Ironically, neither the jail authorities nor the police took any action for 10 long years. Jail superintendent Rashpal Singh said the jail authorities can only inform the district administration and police district concerned in case a prisoner fails to return to jail after the completion of the parole period. "In this case too, we have informed the Deputy Commissioner and Amritsar rural police district after Darshan Singh failed to return to the jail. It was up to them to initiate further action against the accused," said Rashpal. However, Lakha Singh, SHO Mehta police station, said the accused shifted from the village some 25 years ago. But, when Darshan sought parole, he apparently provided his same village address to the jail authorities in order to escape after coming out of the jail, said Lakha Singh. He added that they were yet to locate those papers. Navraj Singh, (24) a resident of Golden Avenue area, was caught near Maqboolpura T-point following a tip-off. The police in a press release issued here today said interrogation of Navraj led to recovery of three stolen motorcycles and a country-made pistol. The police authorities said he was part of a six-member gang, which used to loot vehicles from persons at gunpoint and sell these after forging documents. Other members of the his gang included Ransher Singh of Dhingra complex, Jatinder Singh of Ghannupur, Gurpinder Singh of national city homes, Gurpartap Singh of Sarai Amanat Khan and Deepak Kumar of Tej Nagar. A case under Sections 379, 411, 401, 420, 467, 368, 471 and 472 of the IPC and Sections 25, 54 and 59 of the Arms Act had been registered against them at Maqboolpura police station. While Ransher, Jatinder and Gurpinder were nabbed in January 2011, Gurparp was held in June and Deepak was arrested in January 2012. Navraj revealed that he stole a motorcycle from Durgiana Temple, another from outside Punjab National Bank near Kot Khalsa and third from Anmol marriage palace near Putlighar area. Vimal Kapoor was wanted in as many as five cases registered in different police stations. The police said he was also allegedly involved in the business of illegal financing. During an interrogation he named a dozen of prominent people of the city who were allegedly involved in the betting. However, Sukhwinder Singh Randhawa, SHO, said the people named by Vimal were under investigations and nothing could be said at this moment. Meanwhile, the police today added charges of forgery against the duo and registered a case under Sections 467 and 468 of Indian Penal Code (IPC). Police said the accused were using mobile numbers which were procured in the name of their driver, Parminder, who no longer works for them. The police had also recovered three laptops, mobile phones and dairies from their possession. A case under Sections 13 (gambling using animals), 3 (owing gambling house) and 67 of the Gambling Act and 420 of the Indian Penal Code has been registered against them.